Known as the disease of a thousand goodbyes, dementia affects about 1 in 7 Canadians over the age of 70 (alzheimers.org). While different kinds of dementia vary in their initial presentation and rate of progression, there are features of the dementia journey common to all. This brochure is a basic roadmap of the territory, to help families orient themselves on the journey they are traveling, and see what’s coming farther along the road. The dementia journey can be roughly divided into early, middle, and late stages, then actively dying. This guide outlines the features of each stage, the signposts that tell you where you are on this road, and what may be coming up next. 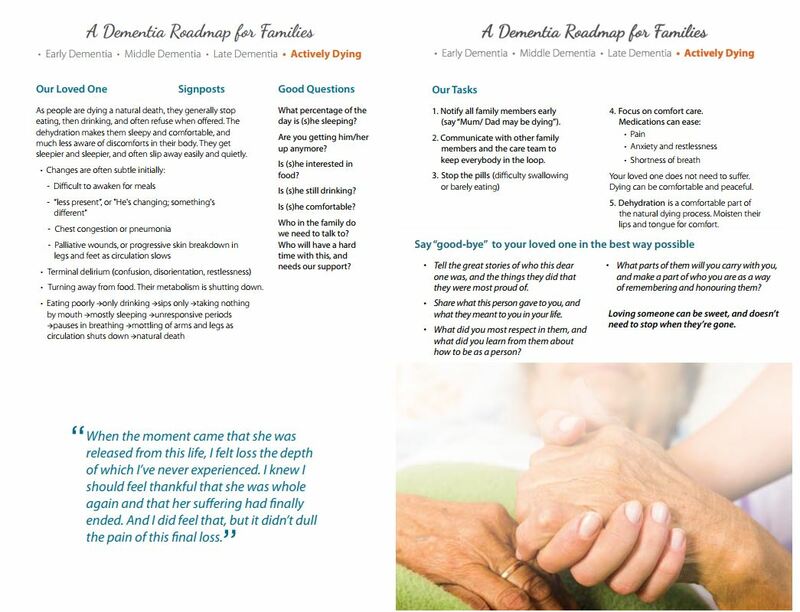 Included are questions that can help you clarify where you are, and suggestions about things we can do as a family and care team to give your loved one the best possible quality of life where they are right now. a great deal of us as caregivers. All of us will feel guilty; about not giving enough, or losing our patience, or dealing with the inevitable feelings of anger and frustration. We need to give ourselves time and permission to grieve, and adjust to all the losses and changes. We need to acknowledge all the things we are doing, and give ourselves permission to care for ourselves too.